THe Partlow range of recorders is extremely versatile and therefore it is impossible to show each and every configuration. These recorders may be customized to suit the application in terms of number of channels, recorder only/ record and control and many other options. See our Contact Page to call or email us to discuss your application. 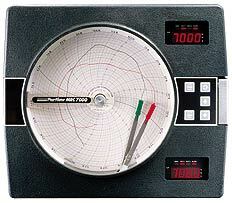 The Partlow MRC 5000 is a 10” circular chart recorder that was designed with simplicity and functionality in mind. The operation of this chart recorder is so easy that all of its instructions fit on one 4” X 6” card. The Partlow MRC 5000 is capable of measuring, recording, and controlling up to two process variables from a variety of inputs. It comes in two basic versions for trend recording – one or two pens. The straightforwardness of these circular chart recorders is immediately evident just by looking at the unit’s face. The operator interface, a four-digit display with three-button keypad, is made for simple daily operation and easy configuration. A clear prompting scheme provides rapid access to all configuration and operation data. The operator interface also provides access to test and calibration facilities with a convenient dual function MODE switch. As if configuring the Partlow MRC 5000 wasn’t easy enough, there’s also an optional Configurator port for ultimate programming ease. Using the optional PC program, parameters can be modified, saved, and downloaded in seconds. A quick look inside the casing and at the chart itself also speaks to the straightforward, functional design of the Partlow MRC 5000 circular chart recorders. You will find just one jumper to configure each port. The two pens, each with configurable spans, are positioned smoothly without any slidewire feedback; this simplifies design and improves reliability. In addition, the 10” chart rotates at the speeds you select. Finding a place to install this circular chart recorder is easy, with its compact 2.5” panel depth and short 1.3” protrusion from the front panel. And, don’t worry about harsh environments – the Partlow MRC 5000 comes standard with a NEMA 3 rating. 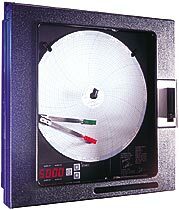 The Partlow MRC 5000 circular chart recorder is ideal for basic digital recording applications with shallow depth panel requirements. The MRC 7000 line offers three choices: a reliable circular chart recorder, a powerful recording controller, and a versatile recording profile controller. These devices are capable of measuring and recording a variety of process variables, including temperature, pressure, level, and flow. The MRC 7000 line offers many standard features: universal input capabilities, isolated process input, process value display for each channel, two programmable alarms per channel, selectable scan rate, sensor break and error fault detection, display/chart and process filtering, programmable output action on sensor break/error condition, auto/manual transfer, control setpoint limits, secured access system, and more. Additionally, many optional features are available with the MRC 7000: single or dual control output, NEMA 3 enclosure, retransmission of process variable, up to 6 relay and four 4 to 20mA outputs, remote setpoint input, remote run/hold, electric motor modulation, 24V DC transmitter power supply, and RS-485 communications. A recording profiler is also available as an option when you order the recording controller; this version of the recording controller profiles on one or two channels. Recorder functions, alarm settings, and many other parameters are easily configured via the keys on the front cover. All user configured data can be protected against unauthorized or mistaken changes; this is accomplished by the enable mode security system and protected against data loss due to power failure by a battery back-up. The MRC 7000 Recorder has an RS-485 communications port option that handles either one or two pen instruments. Each RS-485 communications loop can typically include up to 32 instruments. This option provides for bi-directional communication with a supervisory computer. Instrument parameters and process values may be read. Some instrument parameters may be changed via the communications port. Alarm settings and alarm hysteresis are adjustable via the RS-485 port. The MRC 7000 employs a two-wire half-duplex communications scheme. Communications protocol specifies how the basic communications activities are handled as well as the general format or structure of the messages. A RS-485 Communications Protocol document is shipped with each recorder specified with the RS-485 option and provides detailed information regarding message structure and overall communications. User configurable parameter for setup of RS-485 operations includes an address for each pen, the communications configuration (Monitor only or Normal mode), and the communications bit rate (300, 600, 1200, 2400, 4800 or 9600 bps). Call us at 480-947-9003 for more information.